In 2006, the NRC created a specific task force to investigate inadvertent leaks of radioactive liquid at U.S. nuclear plants. Such leaks can be public relations nightmares for a company. 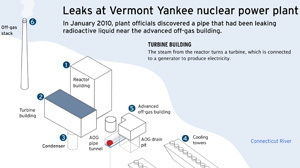 Entergy, the company that owns and operates Vermont Yankee, has come under scrutiny after this leak was discovered.